This morning at 5:15, all the runners set off for the long section: eighty kilometers for the 250k and 48 for 150k. The hot desert wind blew often, but were the windless moments the worst ones, with the temperature exceeding 50 degrees. Mohamad Ahansal has completed in first place, covering the distance in 11 hours and 47 minutes. The Moroccan champion, winner of five editions of the Marathon des Sables, stopping at the last CP said that this is by far the hottest desert in which he has ever run. Nicola Ciani has achieved a very good time with 12 hours and 45 minutes. “The stage is wonderful. The beauty of this desert is matched only by its cruelty”. 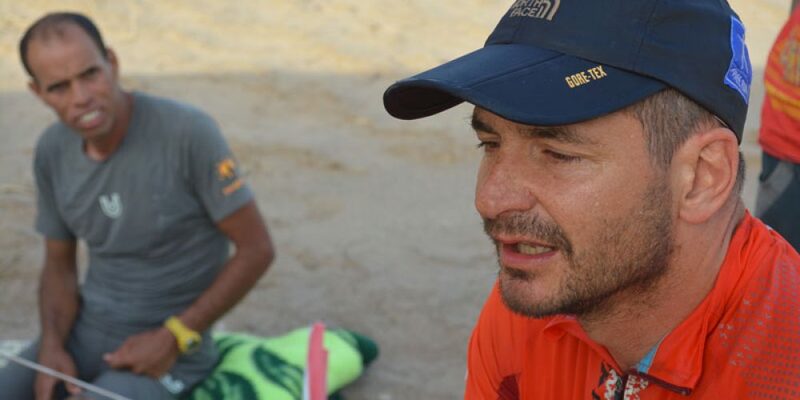 Alberto Tagliabue crossed the line in 13 hours and 41 minutes. All participants of the race are now at the final base camp, in good health and without losing their fighting spirit. The organizers have supported athletes throughout the race, providing them with additional stocks of water between cps. Again the girls stood out for their tenacity in this adventure. Jenny Davis: “At nightfall a bat would not leave me in peace, and a scorpion climbed my leg: I started to scream out loud, thank goodness I did get it out of me!” The race director Paolo Barghini: “It ‘was great to support the athletes in such an extreme challenge.” The arrival times of all runners will be published tomorrow.